As multi-potentialites are changing focus all the time, they need an adapted project scheduling technique. That scheduling technique needs to be lean, with as little administration needed as possible. It has to be simple, simple is always better, and it needs to be effective. Remember the blog post “A surprisingly simple and effective project scheduling technique to try out right away”? This article talks about a scheduling technique used in fast-moving businesses and for agile software development. And therefore, this technique, called Kanban, is perfect for multi-potentialites. So, Kanban is the way to go! In the article we are using a white board or a big piece of paper as a Kanban board and sticky notes for the tasks. But surprise surprise… there is also lots of software out to support Kanban. And often, you can use that software for free. Or they have a light version for free, which in general will do the job, and you pay a monthly fee if you want more functionality. 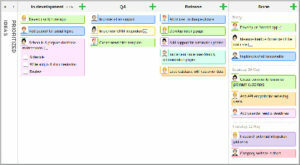 Just one word before starting the review of the Kanban software: All software below have a Kanban board with the possibility to create boards (your projects), lists in those boards (your Kanban columns for each status) and you can create featured cards (your tasks) that you can move around in those lists. The software also has features to work together as a team. And I want to be clear on one point: I am not an affiliate for any of the software. Trello is my favourite and is the one I use daily. 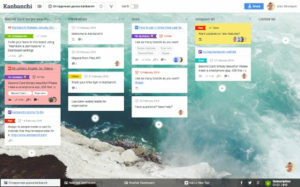 What I like about Trello is that it has a fairly intuitive and user-friendly user interface, and it looks really nice. Trello is cloud based and exists also as an app for your phone and tablet. 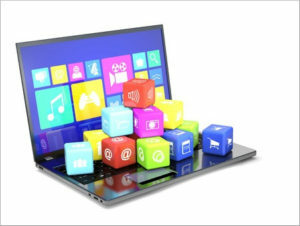 The advantage is that it automatically syncs between your computer, phone and tablet. It integrates seamlessly with Google Drive, Dropbox and One Note. The basic version is free and when you invite friends or colleagues to join and work together on your projects, you get one month free access to the Business Class version per person that becomes a Trello user. Kanbanchi offers dashboards, lists and cards just like the other Kanban software but it takes integration with Google Drive to another level. Dashboards can be converted to files in your Google Drive. It is also possible to push start and due dates to your Google Calendar. For people who were using Trello: You can import your Trello boards into Kanbanchi. The user interface looks really very nice and clean. Cards can be sorted and filtered as needed, and can be organised with text and colour banners. 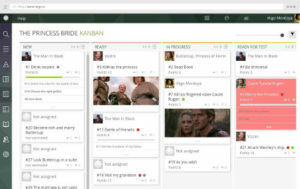 If there wasn’t Trello, I would certainly be using Kanbanchi. In Asana, your dashboard contains all of your projects and with sections and columns, you can divide your projects to match your workflow. You can easily create tasks and in the paid version, you can even set dependencies between tasks. Asana is a web and cloud based mobile app and it integrates with Google Drive, Dropbox etc. 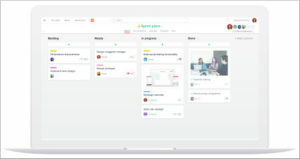 In Asana, I particularly like the fact that you can see the progress of your projects on the boards in your dashboard. In the free version of Kanban Flow you can have unlimited boards, tasks and subtasks. What is practical is that you can collapse your columns so you can focus on just one column e.g. your ‘Work in Progress’ column. Also interesting is that you can set a limit to your ‘Work in progress’ column, so you are forced to complete tasks before starting other tasks. Recurring tasks are supported as well. Pomodoro time management is included with time tracking via a stop watch timer. And there is a mobile app available for when you’re away from your desktop. It is just too bad that integrations with Google Drive,Dropbox, Calendar etc. are only available in the paid version. Restya Board is open source software based on the Restya platform. For those who don’t like cloud technology, Restya is installed on your computer or network and it’s not available as a mobile app. It comes with a lot of functionality. Like Kanbanchi, you can import your Trello boards, if you were a Trello user and want to continue with Restya Board. Customisation of the background of your dashboard and customisation of the colours and texture of your boards are included in the free version, while in Trello this is only available in the Business Class version. The only down side for me is that I found Restya Board was not easy to install. Taiga won the title of “Best Agile Tool 2015” and “Top 10 Open Source Projects 2014” and aims to be powerful, simple and intuitive, highly designed and very customisable, giving your projects their own personality. It is software for agile software development and targeted for business users but useful for individuals as well. A free account on Taiga gives you all the bells and whistles there are and you can have unlimited public projects running on it. But here is the catch: For free you can only have one private project on your board. More privacy needs to be paid for. Kanboard has a minimalist user interface and that is done on purpose. It focuses on simplicity and the number of features are voluntarily limited, dixit Kanboard. You can easily switch between Board, calendar and list views and even automation of repetitive actions are possible. Other interesting features are time tracking and Gantt charts of your projects. Kanboard is open source software and must be hosted on your own computer or network. Which one is the best software? I already made my choice: My favourites are Trello and Kanbanchi. That doesn’t mean that the others aren’t good. All seven above have a different mix of features and there can be a good reason to choose another one. E.g. if you prefer to have the software on your computer or network instead of using cloud technology, or you absolutely need to integrate with Google Drive. The final choice is up to you depending on what functionality you find most useful. ← How Do I Organize My Days?